It may be hard to believe but the spring edition of International Quilt Market is just around the corner. Time to begin planning to be in Pittsburgh May 16-18. Eazy Peazy will be there with lots of new patterns and ideas for you including our latest digital quilt pattern Rufus & Rex. This charming story in 12 redwork panels drawn by Susy Hayes, tells about Rufus the dog and Rex the cat…Forever Friends. 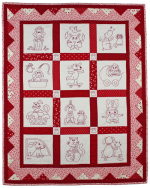 Included on the CD are instructions to make quilts of two different sizes and the software for all the popular embroidery machines with hoops of 6”, 5” x 7” and 8”. Plus there’s a bonus – instructions to make an easy-reader coloring book making use of inkjet printer fabric sheets. Everyone agrees Rufus & Rex is going to be a big seller.